Tarangire lies to the south of the large open grass plains of southern Maasailand and is a well-kept secret on the northern safari circuit. 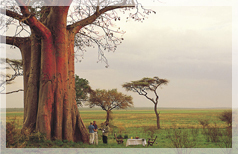 It offers wonderful panoramas of wide savannah grasslands dotted with open acacia woodland studded with large Baobab trees. The density of game is second only to the crowded Ngorongoro Crater. Tarangire is a dry season refuge for many migratory animals (elephants, wildebeest, zebra, gazelles, eland and buffalo), that spend many months of the year outside the park on traditional grazing corridors linking Tarangire with other protected areas. It is hoped that the farms, settlements and mines that are in the path of this annual migration, can find a solution in community based land use that will safeguard the survival of these historic traversing routes. 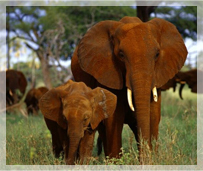 Elephants can be seen in herds of up to 600 at a time, along with masses of wildebeest, zebra, eland, hartebeest, buffalo and oryx, who, migrate from the dry Maasai steppe to the gleaming Tarangire River in search of water during the dry season. The river may reduce in size, but always provides some water for these animals who gather in great numbers along its banks. Predators never go hungry here. Although uncommonly seen, pythons have taken to climbing trees in Tarangire, but as with all snakes they avoid contact with humans. November to February is the time of plenty with succulent green shoots appearing just in time for the newborn wildebeest and zebra. By March everything is lush and wild flowers and butterflies are out in force. Birds are at their busiest and more than 550 species have been recorded. Some of the Serengeti's largest buffalo herds are to be found in the pristine woodlands to the north and elephants abound in this area too. For excellent year round game viewing the Seronera valley in the centre of the park has abundant grazing and considerable numbers of animals including giraffes, warthogs, reedbucks and many other species that sustain resident leopards and large prides of lions. In the south is the saline Lake Ndutu which attracts throngs of flamingoes and in the west the Grumeti River contains some of the largest Nile crocodiles you will ever see. For much of the year temperatures remains between 70-80°F (21-27°C) but nights and early mornings get colder in the months of June, July and August. The dry months of June to September are the best times for game viewing as thousands of animals come to the Tarangire River. January and February is usually dry. Rainy Season: The short rains are in November and December and the long rains fall from March to May, with April and May being the height of the rainy season and best avoided as many camps are closed.